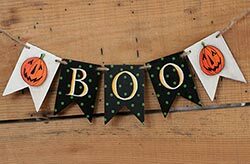 Halloween Banners & Garlands - vintage style beaded garlands for your feather tree, pennant garlands and banners for your wall, mantel, window, or shelf - perfect for your Halloween home decor or party! 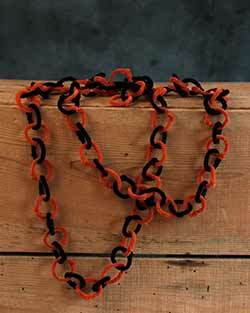 Black & Orange Halloween Garland, perfect for your halloween decor! Trees, doorways, windows, shelves, anywhere you need a vintage halloween accent. Traditional fabric bunting is updated here for fall flare with orange and black stripes - perfect for lining your mantel or banister, or finishing off a wall or window! Black Bat Felt Garland, by Tag. Black felt garland shaped like a string of bats - drape over a window, a table, a doorway, or a shelf! Sold individually. Measures approx 73 x 2 inches. 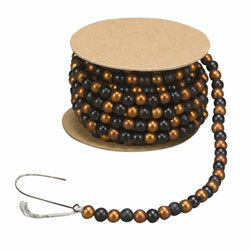 Rustic black and orange garland made of plastic beads made to resemble vintage glass, perfect for a feather tree, piled in a bowl, or over a hutch! Measures 6 feet long. Boo Hand-painted Wooden Mini Garland with Jacks, by Our Backyard Studios in Mill Creek, WA. This garland consists of five hand-painted mini wooden flags strung on a length of jute twine to create a small garland perfect for a shelf, party table, or small tree. This garland consists of three hand-painted mini wooden pennants strung on a length of jute twine to create a small bunting perfect for a shelf, party table, or small tree. 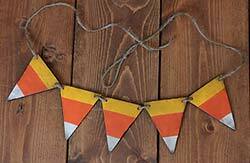 Candy Corn Hand-painted Wooden Mini Pennant Garland, by Our Backyard Studios in Mill Creek, WA. This garland consists of five hand-painted mini wooden pennants strung on a length of jute twine to create a small bunting perfect for a shelf, party table, or small tree. 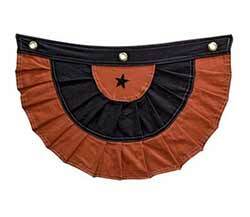 Give your home a warm fall greeting by displaying this burlap banner on a wall, mantel, or hutch! 55 inches long. SPECIAL ORDER. Halloween Glass Garland, by Primitives by Kathy. Measures 6 feet long. Made of glass beads and aged silver tinsel. 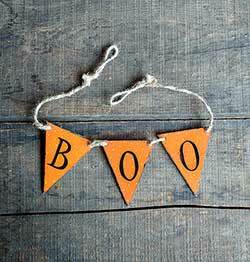 Perfect for your fall or halloween decor, this mini pumpkin garland is perfect for weaving into a larger garland or wreath, decorating a banister, draping over a window - so many possibilities! 10 feet long. SPECIAL ORDER. 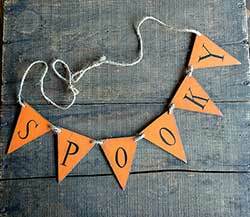 String on a fall tree, fill in a floral garland, decorate a shelf, mantel or banister with festive orange for fall or Halloween! Measures 6 feet long. Made of black and white fabric strips, and wooden ornaments with black and white images of skulls and Halloween messages. Black Spiderweb Felt Garland, by Tag. 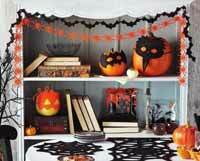 Black felt garland shaped like a string of spiderwebs - drape over a window, a table, a doorway, or a shelf! Sold individually. Measures approx 73 x 21 x 5 inches. This garland consists of six hand-painted mini wooden pennants strung on a length of jute twine to create a small bunting perfect for a shelf, party table, or small tree.